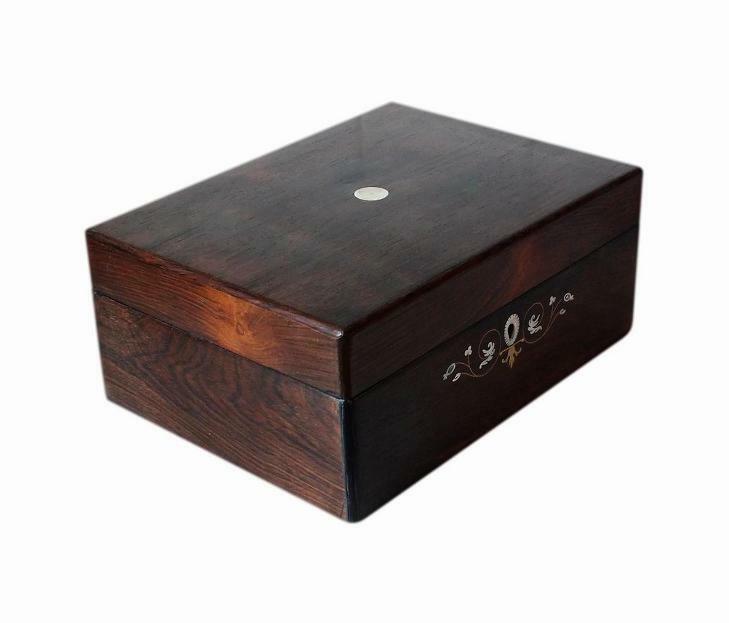 This is a beautiful large antique Rosewood jewellery box. It dates to the late Victorian period, circa 1880/1900. 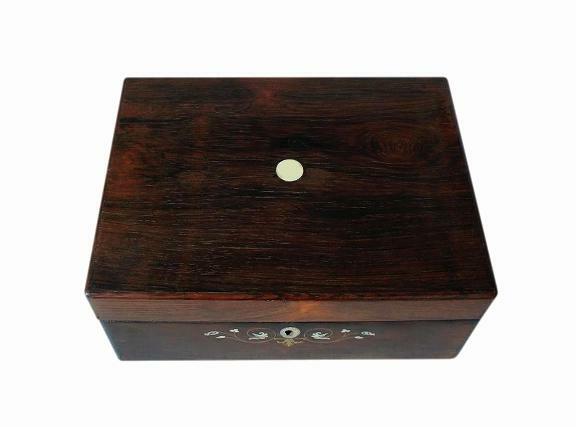 This box has a beautiful dark Rosewood veneer which has superb figuration. 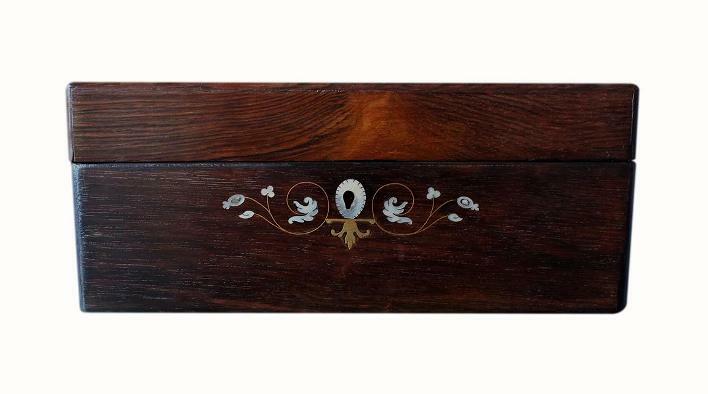 The front of the box has beautiful Mother of Pearl leaf inlay, with the leaves being upon fine inlaid brass vines. There is a decorative Mother of Pearl escutcheon to the keyhole and further brass inlay beneath this. There is a lovely bone roundel to the centre of the lid, set flush into the veneer. The box is complete with its original brass lock. It also has its original brass 'stop' hinges which hold the lid upright. 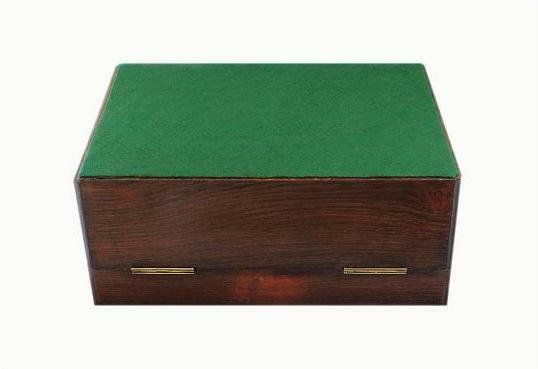 The bottom of the box has a new green felt covering which will protect the surfaces of furniture. There is no key with this box. The interior has a single large deep compartment. This is extremely spacious and will hold a large collection of jewellery. 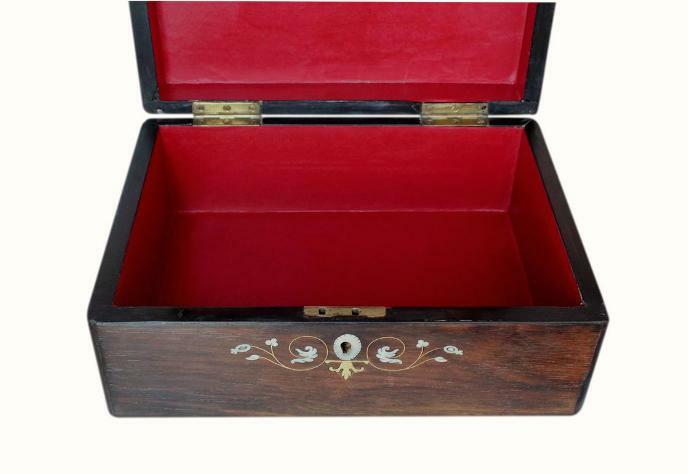 The compartment and the inside of the lid have been relined with textured deep red paper. This has a fine crosshatch pattern and a leather like appearance. This box is in very good condition for its age. It is structurally sound and has no nasty splits or cracks. All of the inlay is present and intact. There is minor age related wear and superficial fine scratches to the veneer. A few small pieces of veneer are missing but these are not overly obvious. There has been a minor repair to a small section of the wood directly in front of the lock. This cannot be seen when the lid is closed. 27.5 by 20.3cm with an 8.2cm depth.